Sasha de Vogel trains on a punching bag at Women's World of Boxing. CHELSEA — Eight years ago, Teresa Scott was 250 pounds. The 39-year-old tried boot camps, gyms, and other fitness classes. Then she discovered boxing. It was an uphill battle back then. Aside from her weight, she ran into a problem common to aspiring female boxers — no coaches took her desire to learn the sport seriously. "Trainers would only take women as students if they wanted to take them out," she said. So she took the fight to the men, carving out a women's only club in a Chelsea gym. In the sweltering gym on West 28th Street, Scott — now 145 pounds — teaches women how to punch one another several nights a week. On a typical evening, women in her class came from all over the city, and all walks of life. Teresa Scott coaches teaches dozens of women the finer points of boxing. "Pay attention to the movement," shouted instructor Teresa Scott last week. Sweat-drenched ladies of all ages were bouncing back and forth on their toes, some swinging, others dodging and weaving from side-to-side. In other parts of the gym — the parts used by men — fighters were yelled at by trainers as they wailed as punching bags as though they were their mortal enemy. The women Scott teaches were smiling, laughing and cracking jokes. Scott founded Women's World of Boxing nearly three years ago. Unlike many women who join the sport, Scott's students aren't interested in competing professionally. They just want to have a fun workout. "I had to prove myself before my trainer would even train me," she said. "It's different here. When you come here and train with us, you've already gained our respect." The sport of women's boxing has become more mainstream over recent years and it's set to gain more exposure at the 2012 Olympic Games, where female boxers will be able to compete for the first time. Women's World of Boxing currently meets at Kingsway Gym, which typically serves heavyweights and professionals. Former heavyweight champions such as Hasim Rahman and Kali Meehan typically train at the gym when they're in town. On a recent visit, Kingsway was dominated by muscled men trying to float like butterflies and sting like bees. "They never really had a lot of women clientele here," Scott said. "Most women, when they come into the gym, they're very intimidated." Scott's students are largely women who have gotten sick of the gym and want a new way to get fit, but some were hesitant to participate in a sport that ends with a knockout. "I didn't actually want to hit somebody," said 42-year-old Alison Thornton of Jersey City, who has been boxing for just under a year. "I think the fear is that someone would have to hit me back, if I hit them." But Scott teaches her students that boxing is a lot more than just right hooks and uppercuts. "It's more about the sport. It's more about strategy," Thornton said. "It's about learning how your body moves and reacts and how it takes certain things." 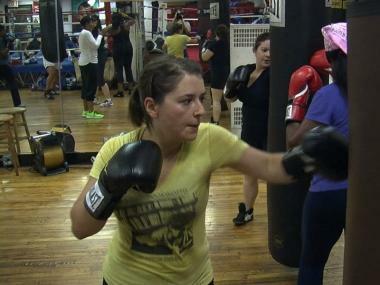 Scott said she's hoping to soon be able to afford her own, women-only boxing gym, which would be the first in the city. Scott has a number of teenage boxing aficionados who want to train with her, but she's hesitant to bring teenage girls into what she calls the chauvinistic, violent world of male-dominated gyms. It's a less accepting world — one where fights in the ring can spill onto the streets. "It's very intimidating," Scott said. "There's a lot of guys. A lot of testosterone. I can only control this environment so much." For now Scott's roughly 50 students come to her several days a week and carve out their own corner in what's still largely a man's boxing world in a male-dominated gym. "Once you walk in and you see other women and you feel that sense of sisterhood that we've created, you don't have to prove yourself," she said. "We're all winners once we walk in that door."